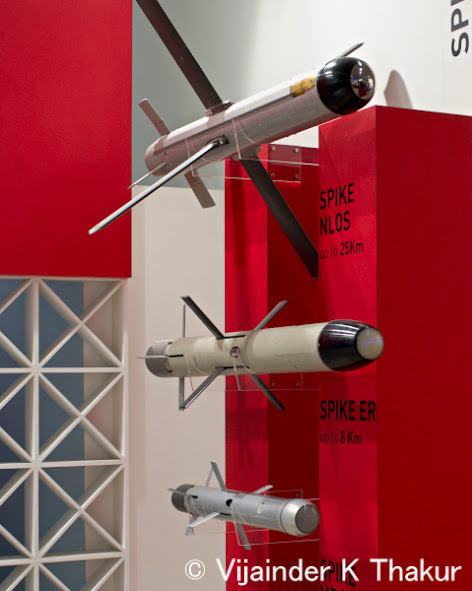 Spike Family of ATGMs on display at DefExpo 2014. The bottom missile is the one that India is all set to purchase. On June 5, 2015 TNIE reported that contract negotiations between Israel's Rafael and MoD for purchase of Spike ATGMs are stalled over the exorbitant price tag that has now been stuck on the missile. MoD and the Army have raised several objections to the commercial bids submitted by Rafael in the second week of May. Besides the cost of ToT, Rafael wants India to pay an additional amount on each missile to be produced in India. As a result, the price of the missile has doubled. There is more. Rafael wants a 4 percent annual escalation on all supplies, including raw material to be sold to Bharat Dynamic Limited (BDL) and will take no responsibility over any quality issue of the BDL manufactured missiles. The DAC cleared the purchase of 8,356 Spike ATGMs, 321 launchers, 15 training simulators and associated equipment from Israel's Rafael Advanced Defense Systems on Saturday, October 25, 2014. The missiles and launchers will equip 355 infantry battalions of the Indian Army. Eventually, 1,900 launchers and 37,800 missiles will be required to equip the 382 infantry battalions and 44 mechanized infantry units of the Army. The deal estimated to be worth Rs 3,200 crore involves transfer of technology. India has reportedly conveyed its desire to purchase 2 ISTAR aircraft to US Defense Secretary Ashton Carter during his visit to India from June 2-4, 2015. The joint statement released during the visit didn't mention the ISTAR aircraft because India wants to keep the purchase low key. India solicited RFI in 2011 from Thales, Boeing, BAE, Elta and Raytheon. It selected the Raytheon system offered on a Gulfstream platform. ISTAR aircraft are used against ground targets and for battlefield management, whereas AWACS aircraft, which India already has, are meant for air defense and aerial targeting. India also uses aerostat radars, which are mini versions of the AWACS and do not help in ground target acquisition. The ISTAR system provides a highly effective, all weather, day and night and target acquisition capabilities. India and the United States have finalized two project agreements for joint development of Mobile Electric Hybrid Power Sources and the Next Generation Protective Ensembles. Each project will receive 1 million in funding shared equally by the two sides. The two sides have negotiated and agreed upon the text of the contracts which will be signed at the end of this month. The US is developing the high-tech mobile power source for use by the Marine Corps in remote outposts. It would work on solar energy, be smaller, more portable and efficient. The use of electronic sensors by the Indian Army along the LAC and LoD is currently heavily constrained by the lack of suitable power source. Protective Ensembles for the Army would be more lightweight and effective when used in chemical and biological hazard incidents.